Oncologic and Perioperative Outcomes of Hand-Assissted Laparoscopic Surgery (hals) Vs Open Low Rectal Cancer Resection: A Case Match Study. Purpose: Hand-assisted laparoscopic colorectal resection, the non-dominant hand in the pelvis has been believed as the major obstacle and may be the cause of difficulties and longer the operative time compares to open procedures. Hand-assissted laparoscopic colorectal resection was found to be associated with less postoperative pain, faster return to bowel function, and shorter hospital stay. Whether HALS should be performed for lower rectal malignancy is controversial. 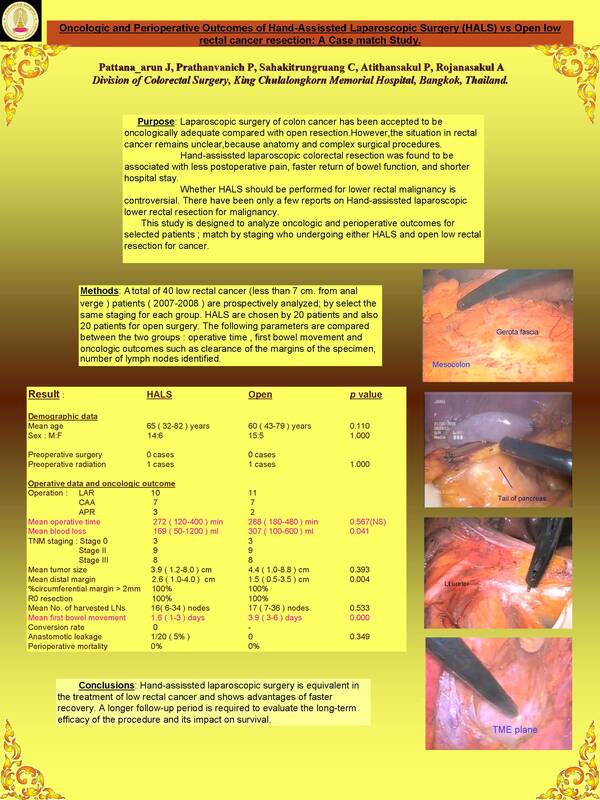 There have been only a few reports on Hand-assissted laparoscopic loawer rectal resection for malignancy. This study is designed to analyze oncologic and perioperative outcomes for selected patients; match by staging who undergoing either HALS and open low rectal resection for cancer. Methods: A total of 40 patients (2007-2008) are prospectively analyzed; by select the same staging for each group. HALS is chosen by 20 patients and also 20 patients for open surgery. The following parameters are compared between the two groups: operative time , first bowel movement and oncologic outcomes such as clearance of the margins of the specimen, number of lymph nodes identified. Pearson’s chi-square, fisher’sExact test and student t test are used to compare differences in demographics and perioperative parameters. The mean tumor size is 4.4 cm in the open group and 3.9 cm in the HALS group (p = 0.393). The mean tumor-free margin is 1.5 cm in the open group and 2.6 cm in the HALS group (p = 0.004). And the mean number of harvested lymph nodes is 17 in the open group and 16 in the HALS group. No wound recurrene is observed. Conclusions: Hand-assissted laparoscopic surgery is equivalent in the treatment of low rectal cancer and shows advantages of faster recovery. A longer follow-up period is required to evaluate the long-term efficacy of the procedure and its impact on survival.